- Feet mount to a standard quick-release skewer* (not included) or to traditional eyelets. - Extra-long (280mm), adjustable Versalock® arms (for frames with eyelets). - Center bracket can be attached to a brake caliper or fender bridge. - Optional (255120-01~04) ‘Trekk Seat Collar’ (not included) can be used to add - upper eyelets to bikes that have none. - Optional (171356-17) ‘Nutted Axle Kit’ can be used to fit bikes with bolted axles. - Suitable for use with all frame materials, including carbon fibre. - Attaches to a standard quick-release skewer or to traditional dropout eyelets. - Streamlined profile improves aerodynamics and greatly improves handling by keeping your load closer to center. - Modular sweepback feet maximize heel clearance and accommodate disc brakes without adding needless extra width that otherwise affects handling. - Dual horizontal mounting bars allow load height to be tuned. - 280mm Versalock® arms are long enough to fit even the smallest of bikes. - Versalock® arms can be DIY bent up to 30 degrees without reducing strength. 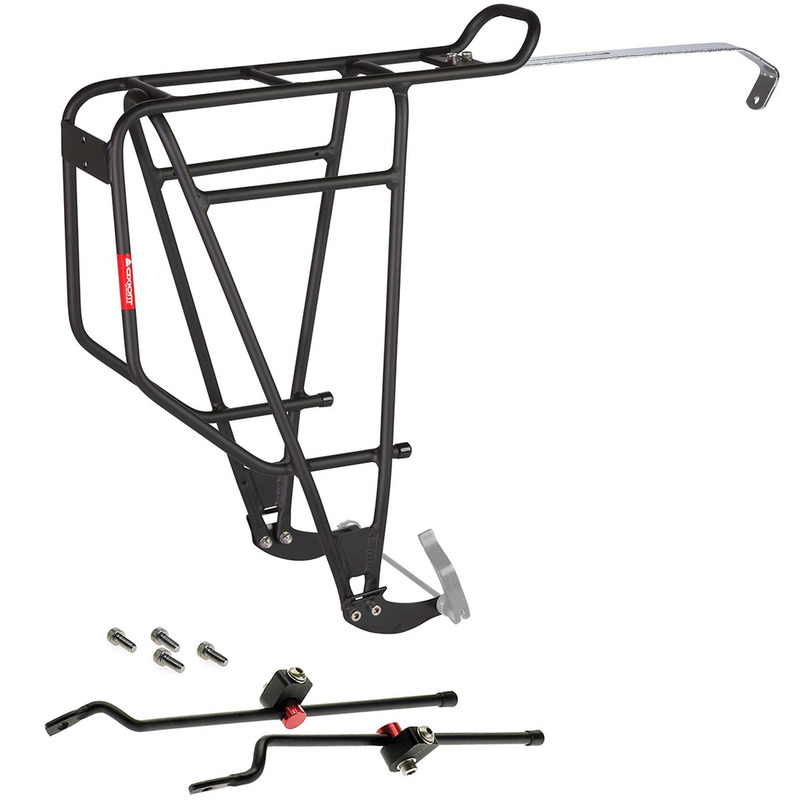 - Versalock® brackets can be mounted under or over the rack platform to help overcome mounting challenges found on some bikes. - Stainless steel center bracket can be DIY bent to accommodate a wide variety of frame designs. - Double welded for extra strength and long-term durability. - Rear bolts on feet can be used as fender mounts.